“Manipur state has immense potential to produce best quality of nutrient rich agricultural commodities but it is all untapped. Farmers face huge losses because their production expenditure is more as all the farming inputs are imported from other states. Adding the transportation expenses the purchasing price becomes high. Rearing indigenous cows for manure in our state is quite difficult than said! I could understand the plight of farmers during direct interaction with them while working for Mumbai based agricultural company. Determined to give farmers a long-term solution ensuring good soil health I decided to produce agri inputs within the state. Thus, after initial difficulties along with my team we successfully developed eighteen different agri inputs made from 100% natural raw materials,” shares Ms. Geetashori Yumnam, managing director, Green Biotech EcoSolutions. Green Biotech EcoSolutions manufactures bio-solutions for horticulture, aquaculture and animal husbandry. It was established in 2014 at Imphal West, Manipur. The technology share was received from Hyderabad, Telangana. “By producing the products within the state we are able to provide best quality agri inputs to the farmers much before the stipulated expiry date. Conversely when the products were imported from other states, due to delay in transportation because of various reasons the agri inputs were not used as it would cross the expiry date. Usually the shelf life of bio-agri inputs is 6-12 months as these are made up bio-organic raw material precisely micro-organisms,” she adds. All 18 products are liquid concentrates that need to be diluted in water before use. 5ml concentrate is mixed in one liter water. 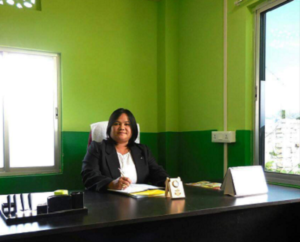 Every product is distinctive and gives best results on the field but Ms. Geetashori specifically mentions about ‘Green –AH/AQ/AG’ as it can be used in multiple ways. 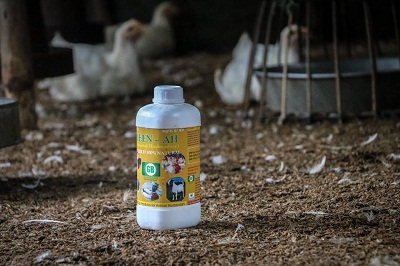 “The basic formulation is same micro culture for Green AH (animal husbandry), Green AQ (aquaculture) and Green AG (agriculture) but it varies in concentrate level. All these perform really well. However, Green AQ is the backbone of our company. We got the recognition only through the popularity of this product! It is widely used across the state in the aquaculture farms,” she highlights. 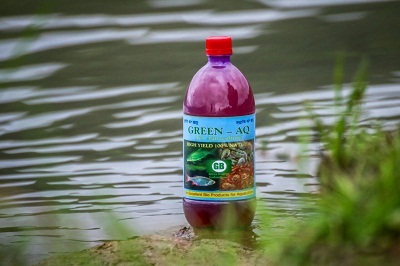 Green AQ is claimed to convert fish waste into useful micronutrients and manage the water in regard to maintaining the oxygen and pH level. Green AG enhances the soil fertility and improves production. 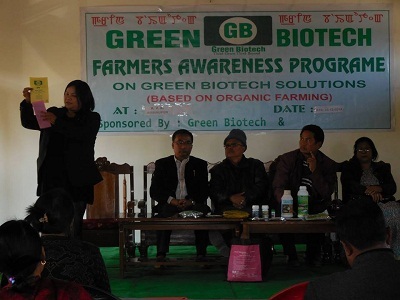 “Green AG is very helpful for the farmers in making the switch from chemical to bio-organic agri inputs. In three years conversion period, when farmers use this product the production doesn’t drops and soil gets healthy. In the first year the quantity of concentrate used is more to support the desired production but it reduces consistently year after year,” she elaborates. In order to provide the assistance to farmers in every way company issues ‘Farmers Card’ to every farmer. In the card, farmer and his farmland details are documented. He is given best possible guidance on production of his farm produce as well as 10% discount on the purchase of various products of Green Biotech EcoSolutions. “Presently we have issued 2800 ‘farmers’ card’ and hopefully by the end of 2018 the number would increase to 3000,” she says. Speaking of challenges Ms. Geetashori says, “Farmers want quick results. They want results within an hour of spraying just like chemicals but they fail to understand the health hazards of chemicals on food produced and environment. Bio-solutions take minimum 4-5 days to show the results as the process is natural and gives enduring outcomes. It is tough to make them understand but we persistently keep trying to explain them the difference of using bio solutions over chemical based farming inputs.” Further to cope with this challenge company conducts various awareness programs to educate the farmers on using bio-fertilizers, bio-pesticides and bio-fungicides as it is safe for the environment, soil and food is residue free. Soil health is top priority for Ms. Geetashori and her team. They are in the process of setting up ‘Soil Testing Lab’ with the backing from NABARD. “At this lab, we shall be conducting detailed soil test of every farmer’s farmland and would maintain individual soil report card. In case of any deficiency farmers would be suggested best solution to rectify the problem. The lab will soon be functional,” she informs. Another plan of the company is to diversify into mushroom cultivation. “We are gifted with the best climatic conditions as needed for mushroom farming. We shall produce and supply the seeds along with hands-on training to the farmers. Agriculture is lucrative just like any other business but all it needs is the conviction and discipline to continue working and if it is done then there is no looking back!” she signs off.